Facet syndrome is an articular disorder related to the lumbar facet joints and their innervations, and produces both local and radiating pain. Ghormley was the first who characterized the ‘facet syndrome’ by back and/or leg pain, as a result from mechanical irritation of a lower lumbar zygapophysial joints. This is more then 20 years ago, but the facet joint has been increasingly recognized as an important cause of low back pain. 55% of facet syndrome cases occur in cervical vertebrae, and 31% in lumbar. This includes all the structures that are a part of the facet joint such as the fibrous capsule, synovial membrane, hyaline cartilage and bone. Neck pain due to cervical facet joint involvement is known as cervical facet syndrome and low back pain due to lumbar facet joint involvement is known as lumbar facet syndrome. The facet joints are joints in the posterior aspect of the spine. In each spinal motion segment there are two facet joints. Although these joints are most commonly called facet joints, they are more properly termed zygapophyseal joints (abbreviated as Z-joints; also commonly spelled as "zygapophysial joints"), a term derived from the Greek roots zygos, meaning yoke or bridge, and physis, meaning outgrowth. This “bridging of outgrowths” is most easily seen from a lateral view, where the Z-joint bridges adjoin the vertebrae. The term facet joint is a misnomer because the joint occurs between adjoining zygapophyseal processes, rather than facets, which are the articular cartilage lining small joints in the body (eg, phalanges, costotransverse and costovertebral joints). This joint is also sometimes referred to as the apophyseal joint or the posterior intervertebral joint. Further the detailed anatomy and clinical anatomy can be learned from here . According to Binder D et al. (level2A), it has been estimated that facet joint pathology is a contributory factor in 15–52% of patients with chronic low back pain. But the prevalence of isolated facet joint pain may be as low as 4%. More important is the presence of facet joint arthrosis in different age groups. In a study from Eubanks et al. (level 2B) there was a prevalence rates of facet arthrosis on 647 cadaveric lumbar spines. 57 percent of samples between 20 and 29 years of age and 93% of the samples 40-49 years of age had evidence of facet arthrosis. By the age of 60, 100% of the samples showed prominent facet arthrosis. The hypothesis that disc degeneration and disc narrowing play a meaningful role in facet joint dysfunction via increased loading and subsequent osteoarthritis , is often cited, but has yet to be supported by sufficient evidence. In rare cases, facet joint pain can occur secondary to a traumatic event, but more commonly, it is the result of repetitive stress and/or cumulative low-level trauma. Data from cadaveric studies have shown that anatomical changes occur more rapidly during sustained flexion than with repetitive movements. Although the studies provides a theoretical model of degeneration, cadavers cannot experience pain and the viscoelastic materials may have altered characteristics. Zygapophyseal joint pain is felt locally as a unilateral back pain, which when severe can spread down the entire limb. The source of pain must be confirmed by clinical examination. radiating pain locally or into the shoulders or upper back, and rarely radiate in the front or down an arm or into the fingers as a herniated disc might. Pain or tenderness in lower back. Local tenderness/stiffness alongside the spine in the lower back. Pain, stiffness or difficulty with certain movements (such as standing up straight or getting up from a chair. Much has been written about the diagnosis and treatment of lumbar zygapophyseal joint pain. A review of the relevant literature found conflicting evidence in support of a relationship between radiographic facet joint abnormalities and facet-mediated pain. This may partly be due to the poor reliability of the lumbar “facet joint syndrome” diagnosis given to patients presenting with primary lower back pain complaints. The“pseudoradicular” referral patterns of the lumbar facet joints may mimic the pain felt from a herniated disc and may make differentiating between the two conditions difficult. 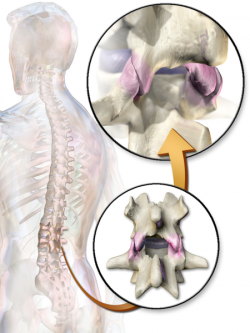 Facet joint syndrome is not the same as spondylosis. The difference between those two is that spondylosis is a degeneration of the vertebrae. If we speak of facet joint syndrome, there is a degeneration of the facet joints which are the posterior aspect of the spine. Facet joint syndrome cannot be reliably clinically diagnosed (Jackson RP2 1992). The most used systems to diagnose this syndrome are X-ray, computed tomography (CT) scan of the spine or a magnetic resonance imaging (MRI) scan. Plain radiography does not provide information in establishing the diagnosis of facet joint syndrome, but it may help with the evaluation of the degree of degeneration. Once degeneration is visible on plain radiography it has already reached an advanced stage. The working diagnosis of facet pain, based on history and clinical examination, may be confirmed by performing a diagnostic block. A positive indication is when the patient experiences a 50% pain reduction after a block has been performed. It involves injecting a medicine into or near the nerves that supply the facet joint. If the pain is not relieved by the injection, it is unlikely that the facet joint is the source of the pain. If these injections help to reduce the pain, we can suggest that the pain comes from the facet joint. Inspection should include an evaluation of paraspinal muscle fullness or asymmetry, increase or decrease in lumbar lordosis, muscle atrophy, or posture asymmetry. 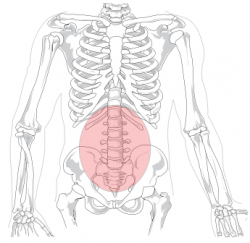 Patients with chronic facet syndrome may have flattening of the lumbar lordotic curves and rotation or lateral bending at the sacroiliac joint or thoracolumbar area. In some cases, facet joint–mediated pain may radiate to the gluteal or posterior thigh regions. With facet joint–mediated LBP, pain is often increased with hyperextension or rotation of the lumbar spine, and it might be either focal or radiating. Sensory examination (ie, light touch and pinprick in a dermatomal distribution) findings are usually normal in persons with facet joint pathology. Patients with facet joint–mediated LBP usually have normal muscle stretch reflexes. Radicular findings are usually absent unless the patient has nerve root impingement from bony overgrowth or a synovial cyst. Side-to-side asymmetry should lead one to consider possible nerve root impingement. Manual muscle testing is important to determine whether weakness is present and whether the distribution of weakness corresponds to a single root, multiple roots, or a peripheral nerve or plexus. Typically, manual muscle testing results are normal in persons with facet joint pathology; however, subtle weakness of the muscles of the pelvic girdle may contribute to pelvic tilt abnormalities. This subtle weakness may be appreciated with trunk, pelvic, and lower-extremity extension asymmetry. Standard treatment for facet joint syndrome pain include intra-articular steroid injections and radiofrequency ablation of the medial branches innervating the joints. Yet there is much controversy in scientific articles related to this standard treatment. Cohen S. P. et al. (2007) investigated several publications about the effectiveness of intra-articular steroid injections and radiofrequency ablation of the medial branches. In uncontrolled studies of people that have never been diagnosed for facet joint syndrome, the long-term relief of back pain after intra-articular steroid injection varies from 18% to 63%. In controlled trials, the results are disputable. In the largest study, investigators report no significant difference between patients who received combined local anesthetic (LA) and steroids versus saline injections. Cohen S. P. et al. also verified that radiofrequency ablation of the medial branches innervating the joints, is an effective treatment for facet joint syndrome. Unfortunately, there aren’t enough studies that follow the same protocol, to make a conclusion about it. For example, the placement of the electrodes plays a very crucial role in processing the results. Bed rest beyond 2 days isn’t recommended as it can have undesirable effects on bones, connective tissues, muscles and the cardiovascular system. Another goal is pain relief. Other scientific sources recommend treating facet joint syndrome with heat, cryotherapy and mobilizations. These techniques appear to have a relaxing effect on the muscles. As the muscles relax, the nociceptive information will decrease. While these techniques have clear advantages, they generally only attain a temporary pain relief as they are often not a final solution to treat facet joint syndrome. ↑ 4.0 4.1 GERARD P. et al, The lumbar facet joint: a review of current knowledge: part 1: anatomy, biomechanics, and grading ", SKELETAL RADIOLOGY Volume 40, Number 1, 13-23, 2010. ↑ 5.0 5.1 Fujiwara A, Lim TH, An HS, et al. The effect of disc degeneration and facet joint osteoarthritis on the segmental flexibility of the lumbar spine. Spine. 2000;25(23):3036–44.